The home screen displays your name and email address, your total storage and how much storage you have used, and it has a place to display your photo. If you have allowed the app to access your location, it also displays a background image based on your current location. In the United States, the image is based in your state. Otherwise, it displays an image based on your country. If you do not allow the app to access your location, a default image is shown. 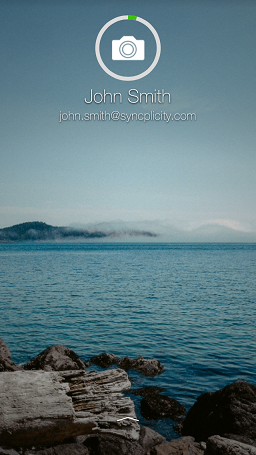 If you would like more information on this feature, see the About the Syncplicity app location feature article. If you have a Gravatar account linked with the same email address you use for your Syncplicity account, your Gravatar image is displayed in the photo. If you do not have a Gravatar account, you can choose or even take a picture and display it here. Just tap the photo area to show the menu where you can choose or take a photo. 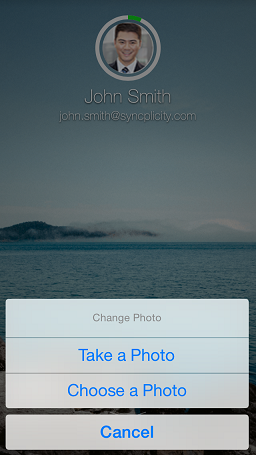 When you first log in to your Syncplicity account, the introductory screen initially displays beneath your photo, your total storage and how much you have used both as an actual figure and as a percentage of your total storage. This information is replaced by your name and email address. However, the green part of the circle around the photo also represents the percentage of the storage you have used, and it remains with the photo. To see your storage in numbers again at any time, tap and pull down the home screen. When you are ready to use the app, tap the arrow indicator or swipe up to go to the main menu. The Syncplicity app displays a location image for each of the following countries.